This is a story about two groups of 6-month-old babies. One group received a very simple intervention. At their first birthdays, babies in this group were quicker thinkers, more likely to be happy, to smile and to laugh. They were more socially interactive, and more in-tune with their caregivers’ reactions. They were less clingy, and easier to soothe when upset, often with just words. These differences were seen in a study of over 1,000 babies, according to a study in the October 2003 Pediatrics. The simple intervention? Those babies got plenty of iron. Healthy babies are born with iron stores of about 500 mg, a gift from their mothers. This starting supply is intended to grow slowly to about 5,000 mg by the time they are asking to borrow your car keys. But if a growing baby is not getting enough iron in her diet, she will become iron deficient. 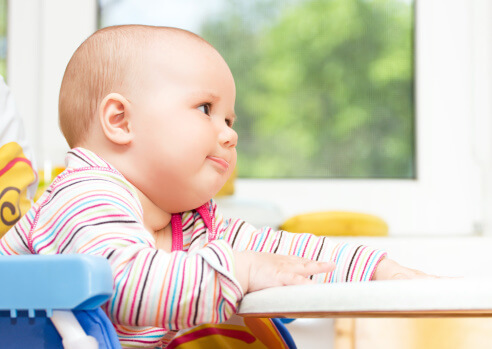 One group at high risk is breastfed babies who delay the start of solid foods. The WHO has identified iron deficiency as one of the world’s highest priority health problems. It can cause behavior and learning problems even if the deficiency is not severe enough to cause anemia. In the United States, about 9 percent of 1 to 2 year olds are iron deficient. Two or three percent are deficient enough to be anemic and show up on the screening blood test. The others who are deficient are often assumed to be normal by their parents and doctors. This large study of iron and behavior took place in Chile, where the babies who were formula-fed got formula with iron or without. Those who were breastfed got a multivitamin with iron (the comparison breastfed babies also got a multivitamin, but it did not contain iron). About 3 percent of the supplemented children did develop iron deficiency anemia; about 23 percent of those in the no-iron group had iron deficiency anemia by age one. The peak age for iron deficiency in early childhood is 9 to 24 months. Vitamins with iron are recommended, starting at 4 months, as a safety net for exclusively breastfed babies, if they are not getting iron from solid foods.